I have been fond of butterflies ever since I was a child. So it comes as no surprise that I have come up with butterfly jewelry designs of my own. Here are some awesome tutorials to help inspire you to make butterfly jewelry. 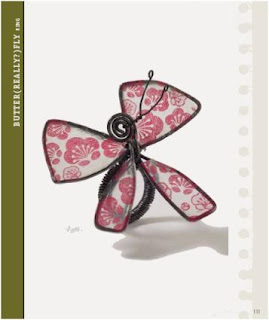 First up is the Butterfly Pendant by Carolyn Baum (for Beading Daily). The wire design beautifully highlights one focal bead. As you can see, she uses a drawn template to help her form her particular design. It'll be fun to doodle some wire butterflies of our own! Beadjewelrymaking has a wonderful Beaded Butterfly Brooch tutorial. It's based on the popular bead and wire form of making small critters. This wonderfully whimsical Butter (Really?) Fly ring tutorial (shown below) is a free pdf from Lark Books. The steel wire ring is embellished with Japanese candy paper. The designer is Brenda Schweder whose work is highly original. It's from her new book, Steel Wire Jewelry: Stylish Designs * Simple Techniques * Artful Inspiration . Click here to read more about Brenda and the book. There is also another project pdf link there for a wire work necklace if you like her style. Lily on Cut Out and Keep has a simple wire butterfly pendant. The instructions are on Melita Gillett's site. 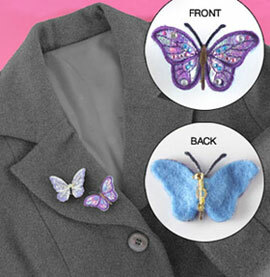 Simplicity has a very easy Butterfly Pin tutorial using butterfly appliques. These might do the trick for embellishing fabric necklaces. Swarovski lovers will appreciate the unusual design Lilies and Butterflies necklace by Fernando daSilva for Beadalon. Willi who is one of the top commentators on this blog, sent me this tip for a crochet butterfly pendant necklace tutorial by Alla Koval of MyLittleCityGirl. Thanks, Willi! My Daily Bead has the sweetest beaded butterfly video tutorial made with fire-polished beads. Really easy! 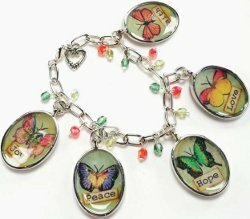 If you are a mod podge fan, check out Debbie Saenz's butterfly charm bracelet tutorial. It is included in Favecrafts' free ebook for all kinds of mod podge projects. Now I am wishing summer will come along quickly so we can also see the real thing! As I am sitting here during a snowstorm, I agree that the butterflies can't come soon enough. I love the designs and tutorials featured today. So pretty...love butterflies...and I know from experience so do many people out there! Wow, lovely outstanding work of art.They are so fabulous and stunning butterfly jewelries.Really a wonderful stuff. Can't wait to try some of these. The crocheted butterflies really caught my attention, as I love to crochet. I've got these listed in my "To Do List". Maybe I'll be able to make a dent in that list soon!! Have a great day! 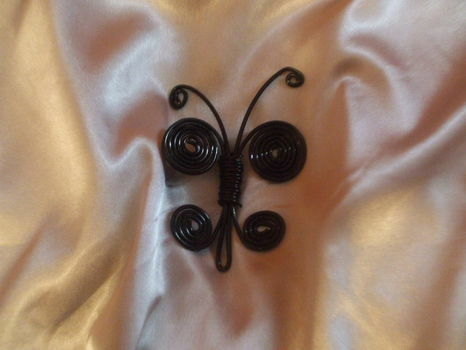 So cute; I really like the wire butterfly, very simple to make thanks! Love the butterflies, lot of cute designs. The wire one is my favorite.